The highlight of the National Hunt season, the Cheltenham Festival, takes place between Tuesday, March 10 and Friday, March 13. The customary ‘Cheltenham roar’ that greets the runners at the start of the opening race, the Supreme Novices’ Hurdle, is a prelude to 27 races of superlative quality, including the Champion Hurdle, the Queen Mother Champion Chase, the World Hurdle and the Cheltenham Gold Cup. The Champion Hurdle, run over 2 miles 110 yards on the Old Course at Prestbury Park, is the feature race on the opening day. Encouragingly, the contest has been won by just three outright favourites in the last ten years, with winners at 16/1 and 22/1 in the same period, so our policy of looking beyond the market leaders could pay dividends. A glance at the current ante post market reveals that the bookmakers 16/1 bar the first four, so we’ve selected a couple that we think could go well at rewarding odds. 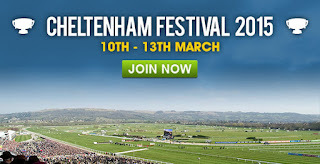 Throughout you can check out the latest Cheltenham results at William Hill plus The Gold Guide to Cheltenham is also useful for a good overview. The one that leaps from the page, as far as we’re concerned, is Kitten Rock (40/1), owned by J.P. McManus and trained in Co. Tipperary by Edward O’Grady. The Laverock gelding was beaten on his sole venture into Grade 1 company at Punchestown last May, but has resumed his improvement this season, winning convincingly on all three starts. Kitten Rock delighted his trainer with his jumping when winning over 2 miles 3 furlongs on his most recent start at Naas in January. On that occasion, he took advantage of a mistake at the last by eventual runner-up, Glens Melody, to win by 3¾ lengths with 18 lengths back to the third horse. It’s worth noting that Glens Melody is no slouch; in fact, far from it. Willie Mullins’ mare only went down by three-quarters of a length to stable companion Quevega in the OLBG Mares’ Hurdle at last year’s Cheltenham Festival and was still on the bridle in the last 150 yards when winning a Listed mares’ hurdle by 7 lengths last Saturday. In fact, Kitten Rock is due to run next in the Red Mills Trial Hurdle at Gowran Park on Saturday, February 14, where his trainer is ‘hopeful that going back to two miles with a faster pace will suit him’. Kitten Rock is the best horse in that race, according to official ratings but, even so, a win against a couple of geldings that ran in last year’s Triumph Hurdle, would surely see his odds cut for the Champion Hurdle. Of the others, Garde La Victoire (50/1) never threatened in last year’s Supreme Novices’ Hurdle, eventually finishing fourteenth of eighteen, beaten 18½, but won the Greatwood Hurdle at Cheltenham in November. He also battled back gamely to beat Jollyallan (a 12/1 chance for this year’s Supreme Novices’ Hurdle) by half a length at Sandown two weeks ago. Like Kitten Rock he has about a stone to find with current ante post ‘hotpot’, Faugheen, but the case for Willie Mullins’ charge is hardly watertight and he heads straight to Cheltenham without a prep run this calendar year. So, as just a little ‘taster’ of what to expect at the Cheltenham Festival, our two against the field in the Champion Hurdle are, in order of preference, Kitten Rock (40/1 with Bet365, Betvictor, Coral and William Hill) and Garde La Victoire (50/1 generally available). Above all, have a cracking Festival and good luck!